This Daylight set with 3 daylight lamps is brightness adjustable due to your requirements. Through its high power output, it is uniquely designed to provide even light source for static and video photography. Three energy saving lamps can be switches on/ off individually. 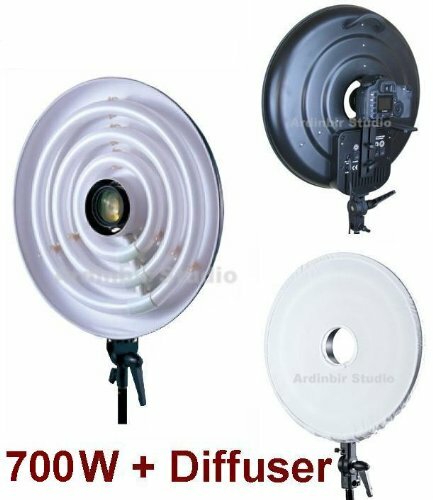 Apart from using it as a ring light for macro photography, with the power of totally 90W, it can also be used as a side light or top light. It lightweight, energy saving and cool characteristics make it your perfect lighting partner. Outer diameter: 480mm / 19"
Note: The cameras, camcorders in the pictures are just for showing. They are not included in this listing.